Head to the Backyard for $2 rotating domestics every Sunday. As a college kid home for the summer with an unpaid internship and a lot of friends to catch up with, finding places to chat with old buds over cheap drinks is a must. Gone are the days of swigging peach-flavored Smirnoff from a bottle and chugging lukewarm Rolling Rock from secondhand solo cups. It's time to drink like an adult, and happy hours are a great excuse to do so. This is my first summer in the Inland Northwest as a 21-year-old. I have limited money and a little too much time on my hands. Could you ask for a better guide? Cricket's in North Idaho (424 Sherman Ave.) is an old Coeur d'Alene classic. It's been around forever, so maybe it's no coincidence it offers one of the best happy hour deals in town. If you wanna get a buzz for cheap, this place is your pal. Seven days a week from 4-7 pm you can get $3 double well drinks. Cricket's has extensive outdoor seating, which I embraced one recent warm, summer evening while testing a simple classic: gin and tonic. It was refreshing, strong, and after two rounds I had cash left over. Win! The teeny tiny bar attached to the historic Garland Theater, Bon Bon (926 W. Garland) is a quirky girl's paradise. Not only do they pour some delish drinks, you can also catch a discount movie right next door. Find $5 specialty, seasonal cocktails here during happy hour — Monday through Thursday from 4-7 pm, Friday and Saturday 10 pm to close, and all day Sunday. I tried out the "Dancing Queen," a mix of quinquina, lime, ginger and tonic. One word to describe it: dangerous. The Garland is showing throwback films all summer long as a part of its annual "Summer Camp" series, held every Tuesday night at 7 pm. Spend $10 in Bon Bon (that's two drinks, my friend), and your admission (normally $2.50) is free. If cocktails aren't your thing, don't fret. 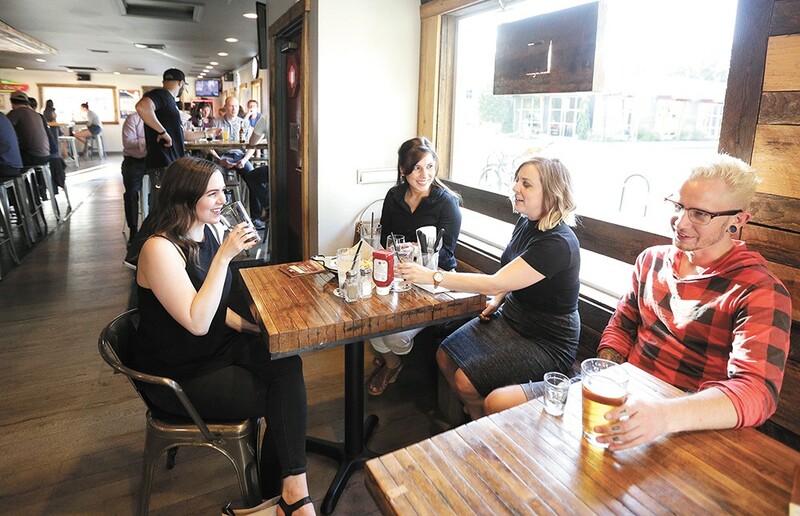 There's plenty of places around the Inland Northwest that offer great beer deals, too. My personal favorite is MOON TIME in Coeur d'Alene (1602 Sherman Ave.). They have an awesome $1 beer night on Thursdays that also comes with a side of live music. Each week, the restaurant picks a different microbrew on tap, so it's worth going week after week. While there's a $3 cover to get in, you get access to great tunes all night and all the $1 pints you can drink. Revolver Bar & Lounge, 221 N. Division. Revolver North, 633 W. Garland Ave. The original print version of this article was headlined "Drinking Like an Adult"